The latest boot to be released in the Adidas adiPower Predator range comes with a serious amount of attitude – as worn by David Beckham. Rather than featuring a leather upper, this version comes compliments of a glossy Microfiber, with the official colorway listed as Prime Ink Blue/White Metallic/Electricity. The combo really pops and this could actually be one of the better looking releases to date in the adiPower range. Beckham has been wearing these with a lot of style for the past few weeks and it seems that fans really like them! I have received a few dozen emails about their availability the past few weeks, and finally here they are. Even with a microfiber upper, this release comes in at a pretty smooth 7.8oz, which is pretty unbelievable considering these are considered to be a power boot! I personally like what Adidas has done with this latest Predator release. The overall look and performance of the boot is very competitive and they offer a great mix of power with a lightweight feel. Adidas has re-engineered the entire Predator Zone in a pretty cool way and now refer to it as the Predator Element. Basically, a silicon rubber is strategically positioned and tuned to create a uniform surface with rebound effect, for those times when you need some extra power behind your shots. Holding a pair, it is hard to comprehend the fact that they fall into the power category, but I can tell you after testing the adiPower that they have everything that you could require and more. 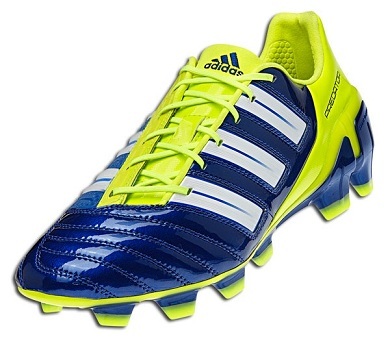 If you decide to go for a pair of these, the adiPower comes in around the $200 range. Really nice colourway. Though i wish that would produce something this stunning with leather instead. I personally would get it! Do you think they'll release an Absolion in this color way? As much as you may think it matters if the shoe is wet… it doesn't! I own the shoe and I have had leather Preds too. You don't actually believe the ball is going to slip off of your touch any less with leather do you? Another point is that the shoe will last longer with microfiber/synthetic, your feet won't get wet, and rain won't ruin your $200 shoe.